Before Tecumseh Fitch put forward the size exaggeration hypothesis, many thought that the lowered larynx was unique to humans, which suggested that it was an adaptation specifically for the production of speech. However, Fitch showed that lowered larynxes appear in other animals, most notably the red deer, to exaggerate their perceived body-size by making the low calls of a typically larger animal. Whether this is the adaptive pressure that caused the human larynx to lower is still a controversial issue, and I talk about a couple of hypotheses here. 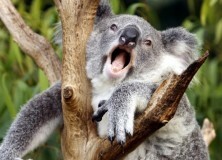 I was reminded of this this morning when I saw this Koala on the BBC news making incredibly low mating calls. However, the Koala don’t achieve this incredibly low bellow by lowering their larynx, instead they have an extra, larger pair of (previously undocumented) vocal folds spanning the intra-pharyngeal ostium (IPO), an oval opening within the velum.